The orchid family (Orchidaceae) is probably the largest family of flowering plant in the world. 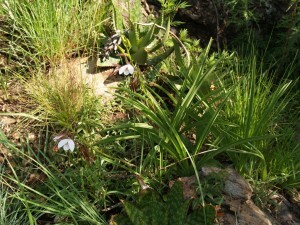 Only the Asteraceae (daisies) has a comparative number of species and genera. Generally when the word “orchid” is mentioned one tends to think of tropical rainforests or the Orient, when, in fact we have some beautiful indigenous species occurring in our area! However, don’t expect the kind of flower one buys in a pretty pot in a shop, but see and appreciate them for their own beauty and because they are from here, our special World Heritage site! At this stage none of them are on any endangered lists, but with the problem of urban sprawl, their habitats are becoming more and more threatened. 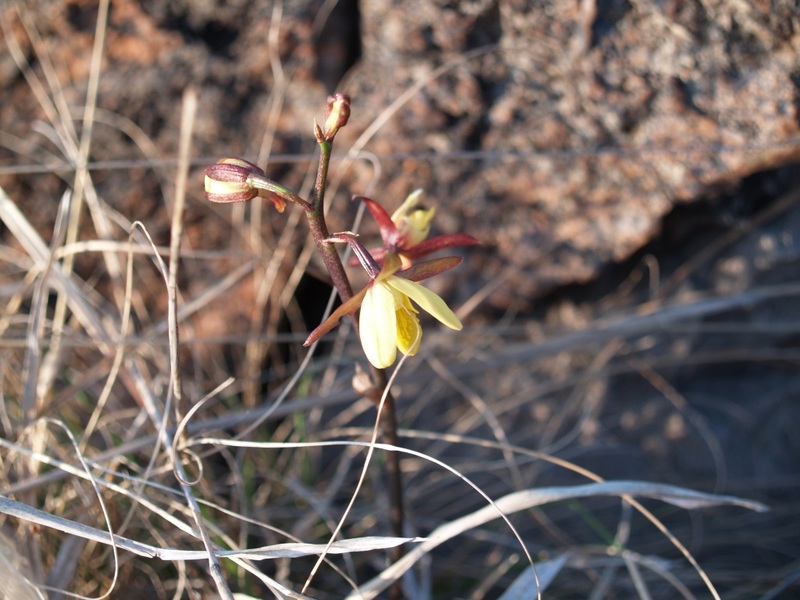 As individuals living in the Cradle, we must each try to see if these flowers occur on our properties and try to protect and conserve them. They certainly are beautiful and deserve protection. 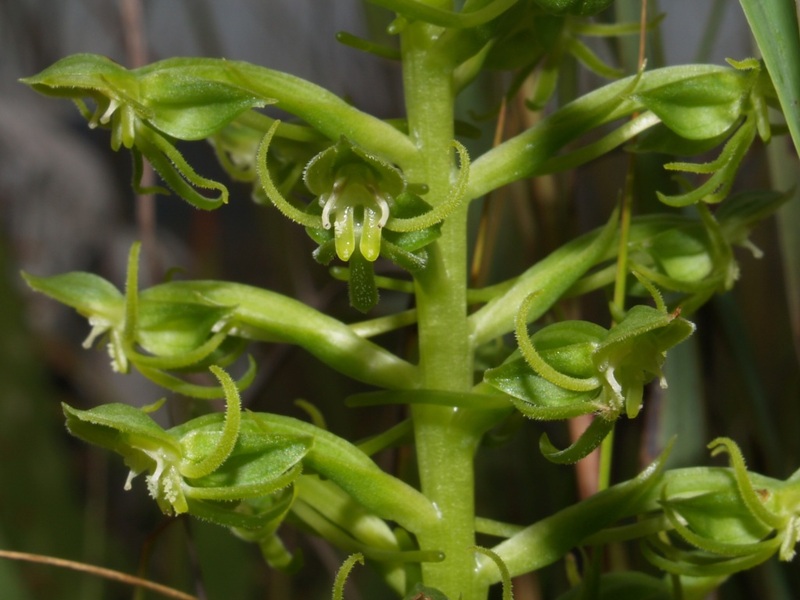 When is a plant an orchid or how are they defined? Well, those of you who are really interested in knowing a lot more, should get a guide where proper, botanical descriptions are given. 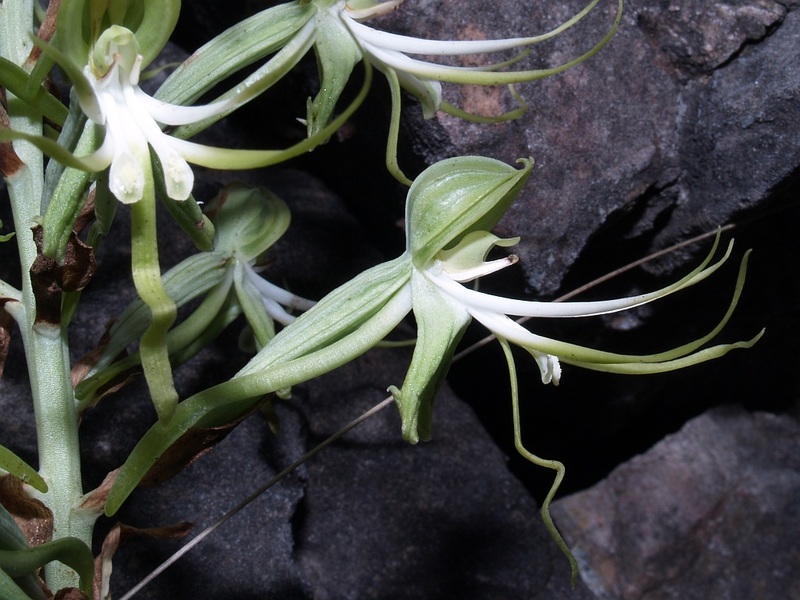 I did not wish to write lengthy descriptions and with our photos and descriptions, we merely wanted to introduce you to the species found here so you can look out for them and help protect our floral heritage. So far we have identified seven different species and, of course, our database will be updated should we find more. Here they are in alphabetical order, and, please note, with very brief descriptions. An excellent guide if you want to know more is the Field Guide to the Orchids of Northern South Africa and Swaziland, 2008 (Douglas McMurtry; Lourens Grobler; Jolisa Grobler; Shane Burns). 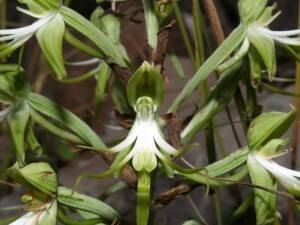 Description: The stems and leaves are grey-green to blue-green and this orchid grows to a height of between 450 and 800 mm. 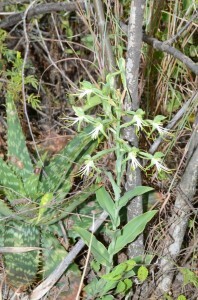 The flowers appear densely and the colours are spring-green and white. The Bonatea antennifera are most commonly found as individual plants growing in leaf-litter, always under the shade of trees and shrubs like the Acacia karroo, Acacia robusta, Acacia caffra, Euclea crispa and Gymnosporia buxifolia. In our area we have also found quite a few around the entrances of caves and the excavations made by the calcite miners of the late 1800’s and early 1900’s. 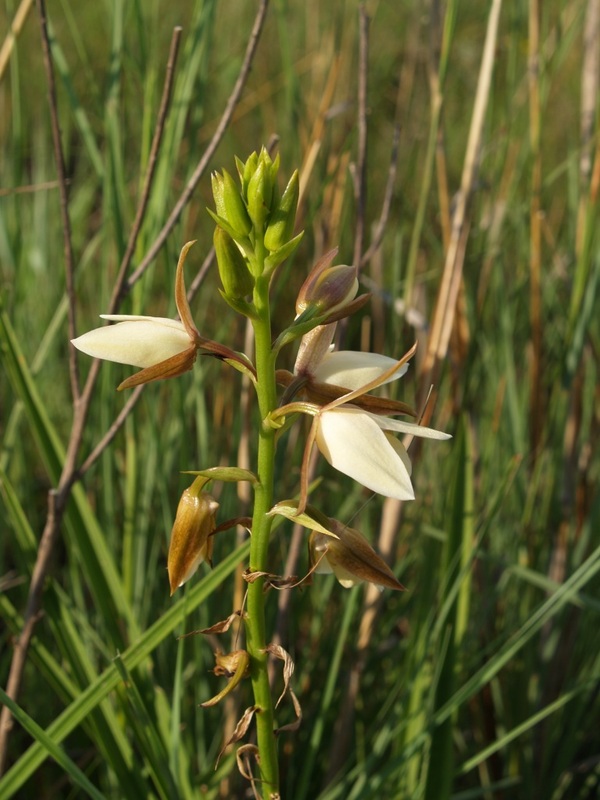 The flowers are without scent during the day but become strongly perfumed at sunset to attract their hawk moth pollinators. 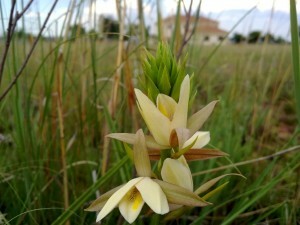 The fragrance is intense, sweet with coconut overtones after 18h00. Prior to the 1980’s this orchid was common and abundant in and around the Johannesburg area but huge urban expansion has reduced its habitat considerably. 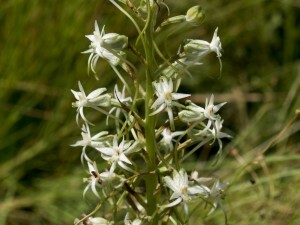 Description: Grows to a height of between 270 and 650 mm tall and flowers appear fairly densely. 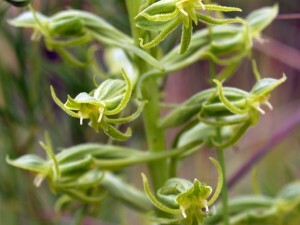 The sepals are greenish with the outer surface overlaid in olive-brown to reddish brown and the inner pale olive. Petals’ outer surface pale cream-yellow and veined. The lip is cream-yellow with a deep yellow crest faintly veined brownish and/or purple. 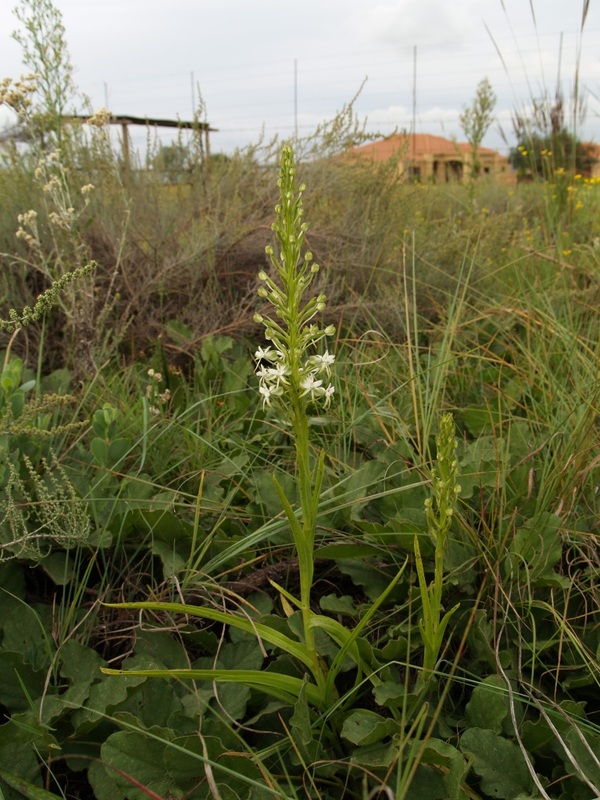 Eulophia bainesii is found in open grassland, often rocky areas, also in acacia savannah or quartzite areas in Gauteng. 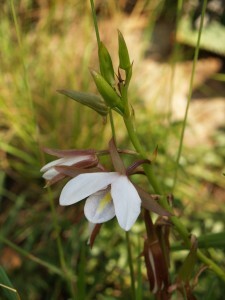 The flowers do not have detectable fragrance. 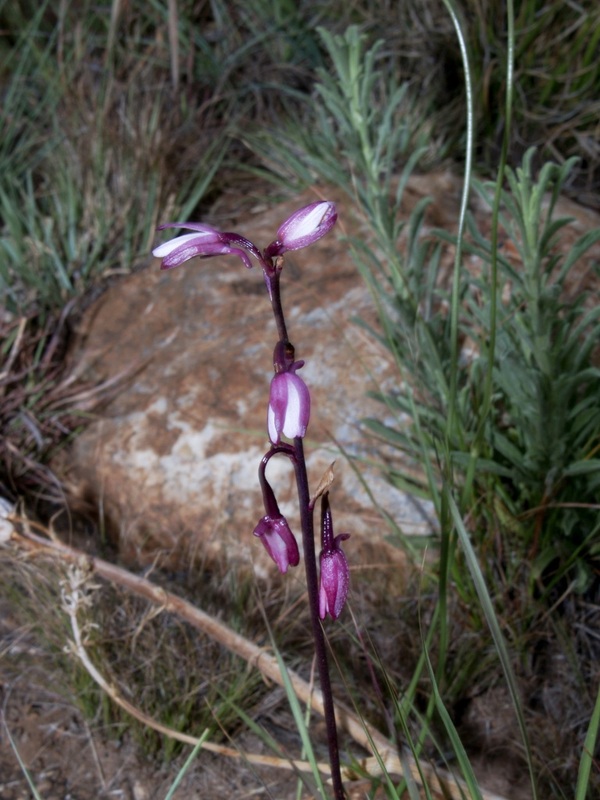 This orchid species has a widespread distribution and is found all over Sterkfontein Country Estates. 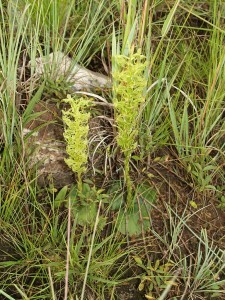 Description: Slender terrestrial growing between 150 and 400 mm tall. 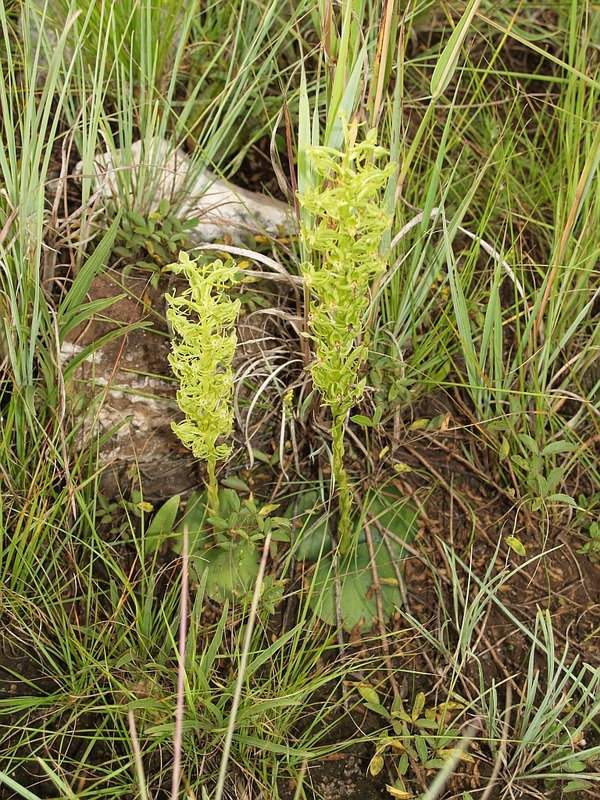 Inflorescence laxly flowered and the sepals are reddish-brown to dark purple. 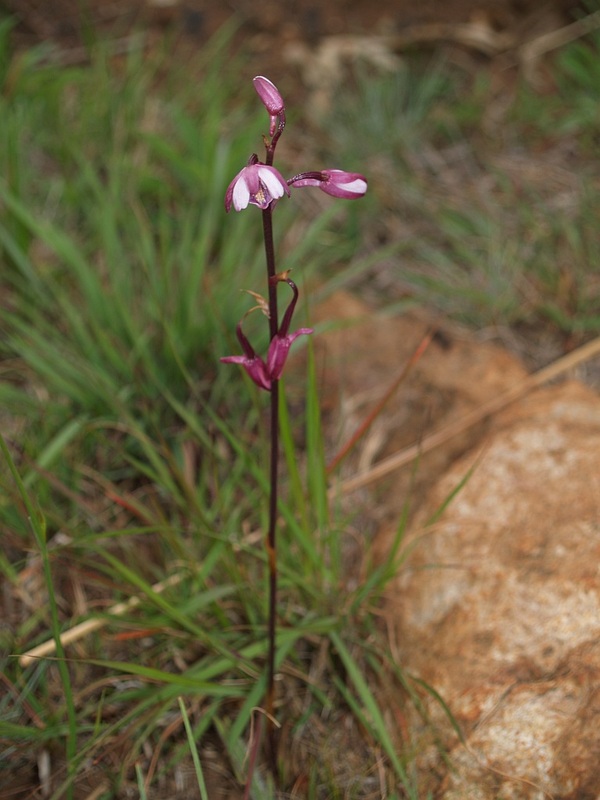 Petals’ outer surface pale pink to purple-pink and the inner is darker often lightly veined with a bluish tint. 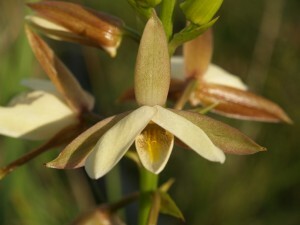 Eulophia hians flowers in very early spring, in the pre-rain period, presumably using reserves stored in the chain of underground pseudo-bulbs. It is often found growing along quartzitic ridges and outcrops. Although the flowers open, this species always sets seed prodigiously and apparently by self-pollination. They have no detectable fragrance. They have a huge distribution area, but in our Estate are fairly rare. Description: This slender terrestrial grows to between 140-350mm tall. 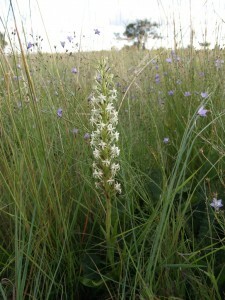 Inflorescence laxly flowered. 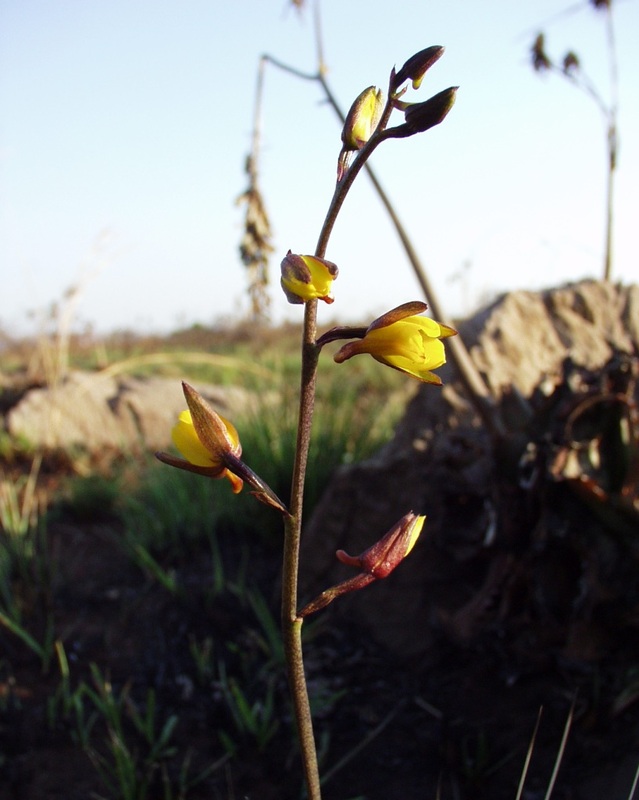 Sepals’ outer surface yellow to greenish yellow, variously suffused reddish brown to chocolate. 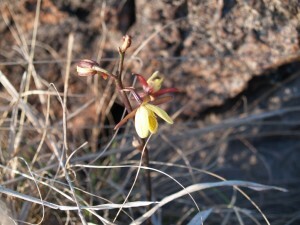 The inner surface is a clear greenish yellow. 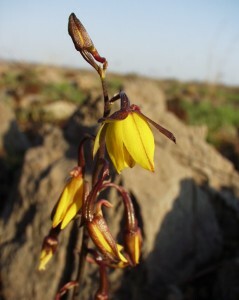 The petals and lip is a bright yellow and lip sides often veined bluish. The spur is 4 to 7 mm long, prominent and reddish. 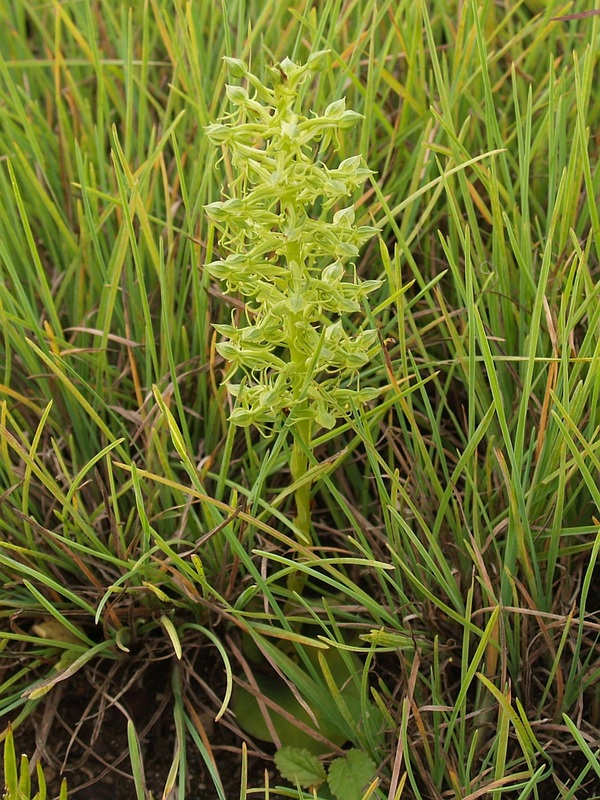 This is another orchid of the pre-rain flora flowering even before the surrounding grasses. 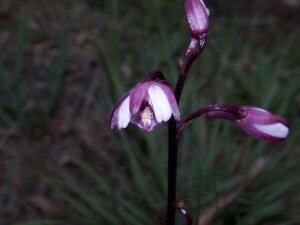 The pseudo-bulbs (swollen with stored reserves and fleshy roots) tide this species over in winter. 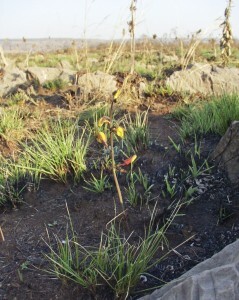 The longer days and rising temperatures prompt the raceme to appear. 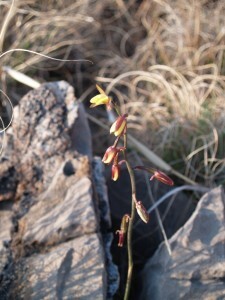 It is usually found growing on rocky slopes in grassland. Fragrance faint, sweet, vanilla detected in the afternoon. This orchid’s existence is seriously threatened by urbanisation. 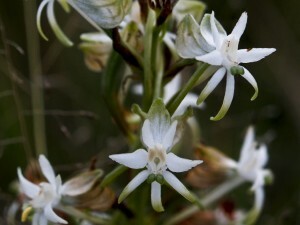 Description: Eulophia ovalis grows to a height of 200 to 550 mm tall. 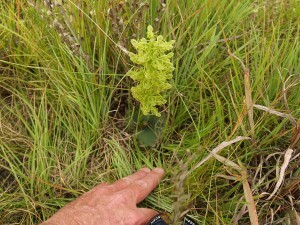 Leaves at anthesis are fully developed and inflorescence fairly laxly. Sepals’ outer surface purple-maroon and inner greenish suffused pinkish lilac, veins often darker. 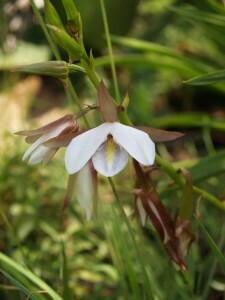 Petals’ outer surface white, often suffused pink, inner suffused pinkish lilac, veins often darker. 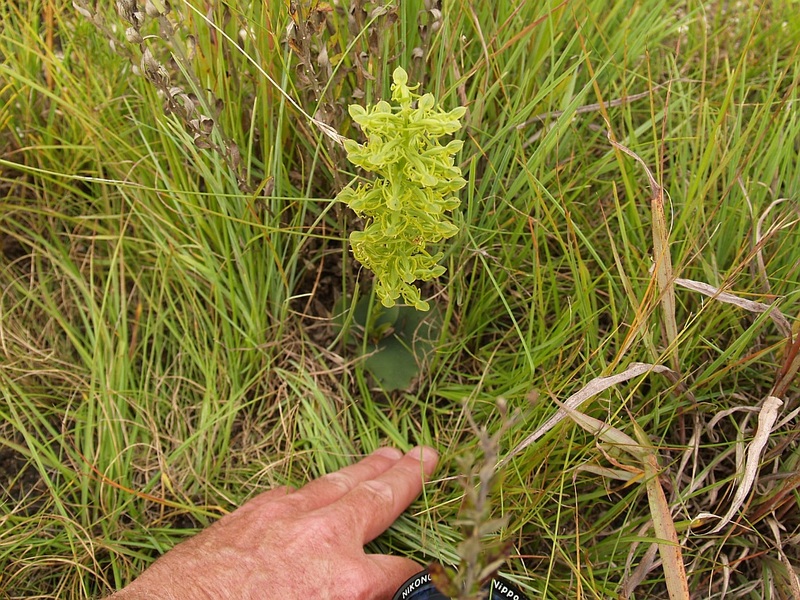 The basal crests are yellow becoming paler on the apical lobe. 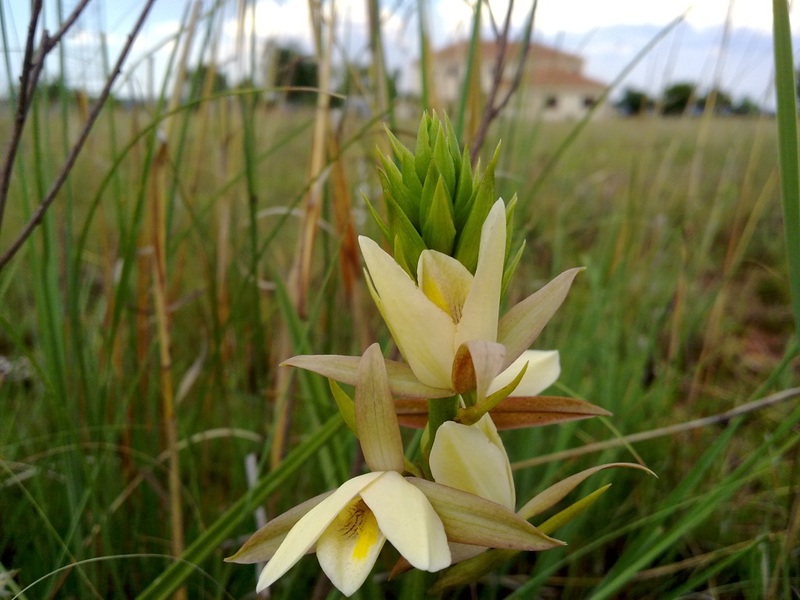 The E. ovalis is found in a variety of different habitats from damp high altitude, sour grassland with high rainfall to areas in its western range that receives less than 600 mm rain per year. 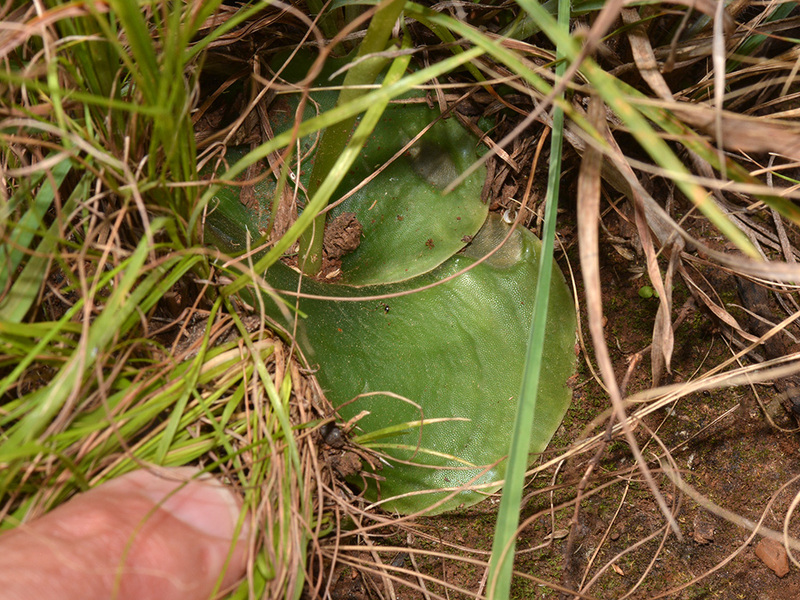 They are often found growing sympatrically with E. bainesii (especially in Gauteng) but they are definitely two different species as no intermediates have been found. 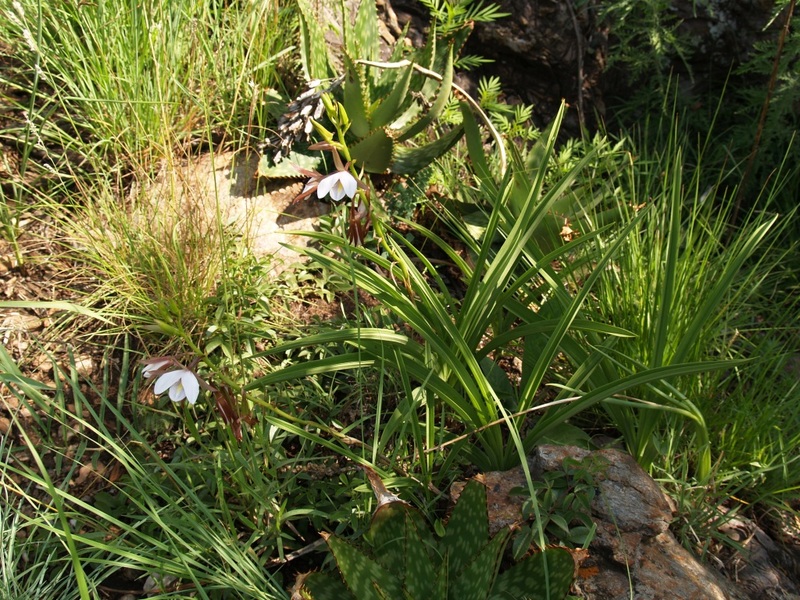 Generally E. ovalis has shorter leaves and smaller flowers than E. bainesii. They have no detectable fragrance. 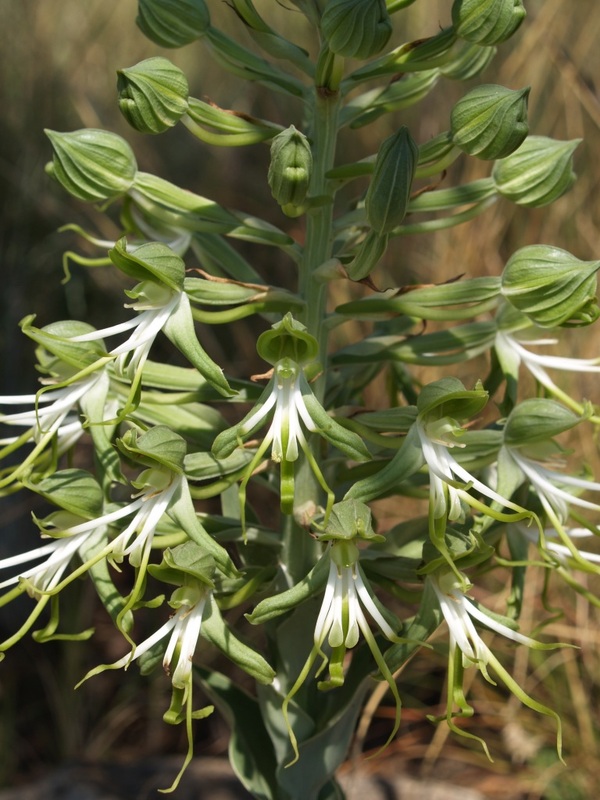 They have a huge distribution range with numerous localities, but north of the Olifants River it becomes very sporadic and rare. They are also much scarcer in our Estate than E. bainesii. 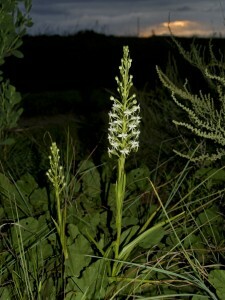 Description: This orchid is moderately slender and grows to a height of between 200 and 400 mm. 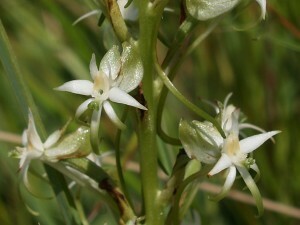 Approximately 10-20 flowers appear per plant. 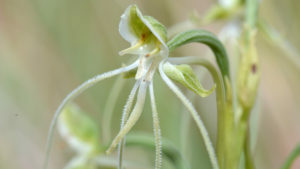 The flowers are light green (tinged with white) and has distinctive long thin spidery puberulous (To make it easier – it looks like long thin, beard-like tendrils hanging from each flower). 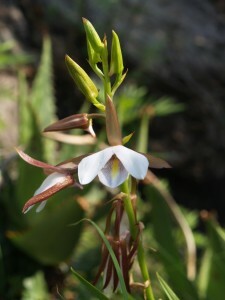 Petals are divided and lower lobes between 30-45mm long. 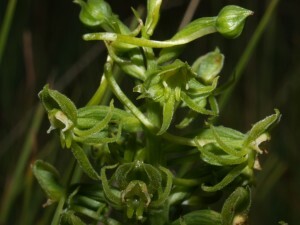 Mid-lobe about 11-13mm long; side lobes about 23-38mm long. The spur is gently incurved and between 35-45mm long. 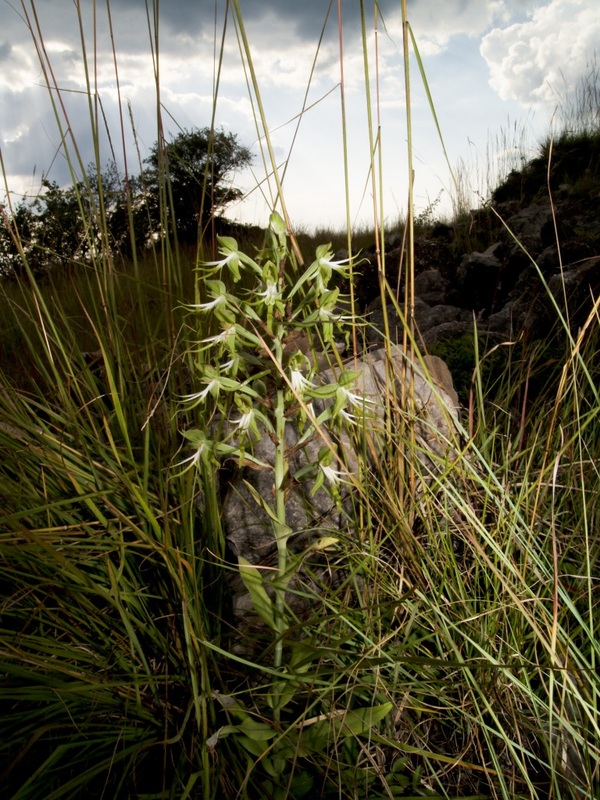 This orchid is found in typical open grassland and is endemic to KZN, Gauteng and Limpopo. No fragrance is detected. 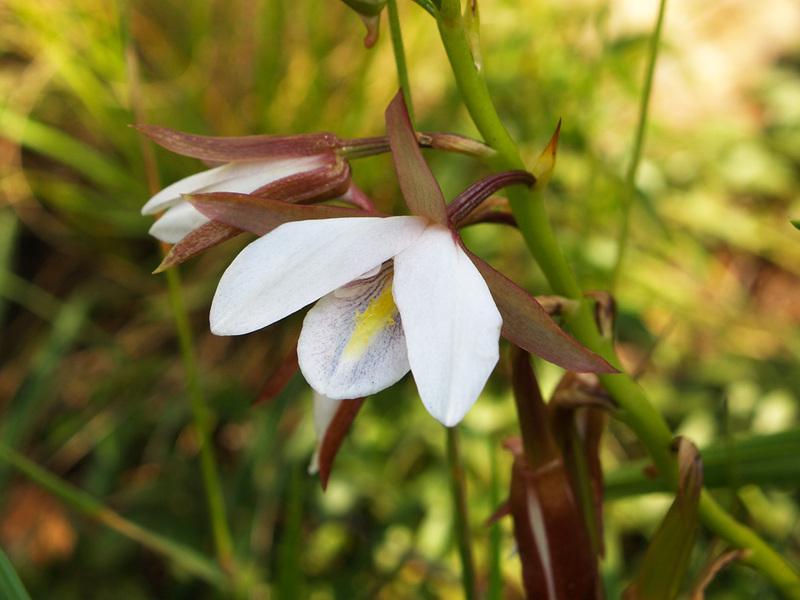 Very little is known/written about this graceful orchid. 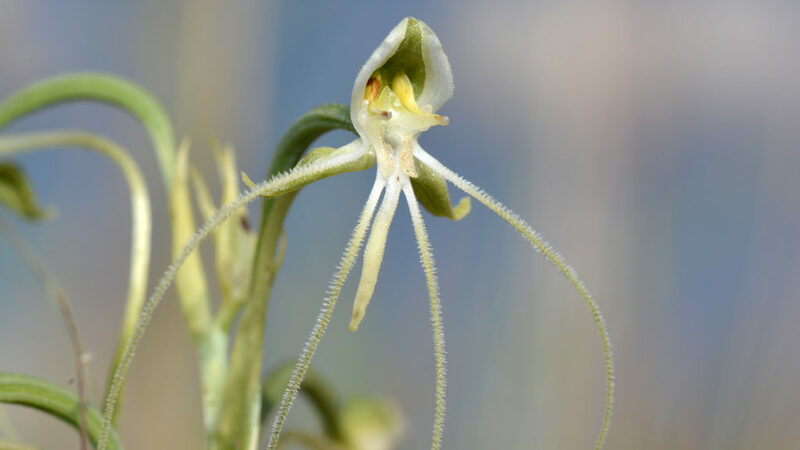 At a quick glance, one might confuse it with the Bonatea antennifera orchid, but it is actually very distinctive with its long beard-like tendrils hanging from the lower petals. Up until the mid 1970’s it was common, but due to urbanization and neglectful town planning it has now become very scarce. On SANBI’s red data list it is described as “near threatened” as only 5-10 known locations exist. 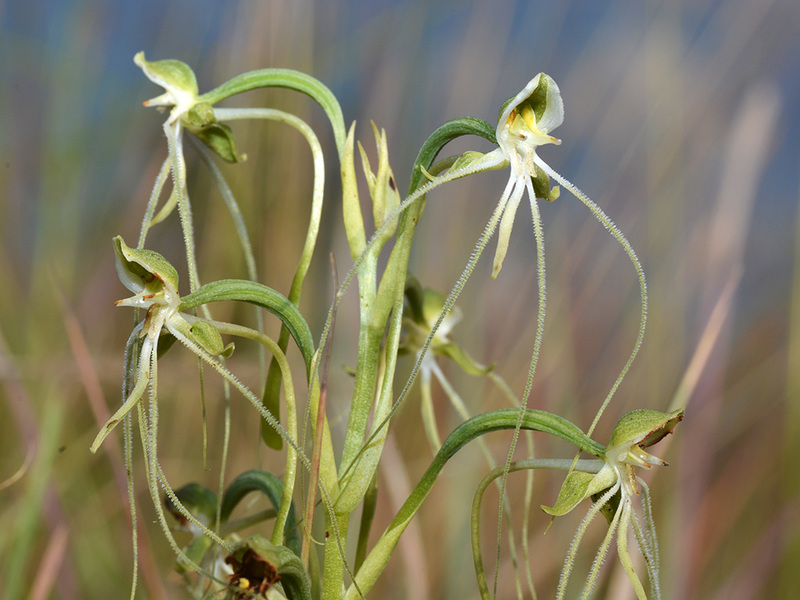 According to our book on orchids it is seen as “rare” and “endangered”. And now, we can say with confidence it is also found on our property! 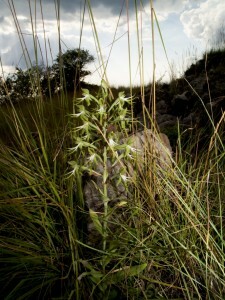 Habenaria kraenzliniana, the entire plant becomes all but invisible in the veld! 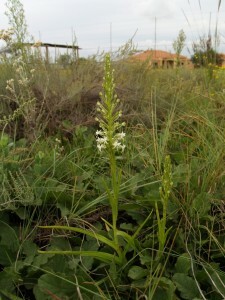 Description: Grows to a height of 400 and 830 mm tall. Florescence somewhat laxly and appears at first sight to be overall white. 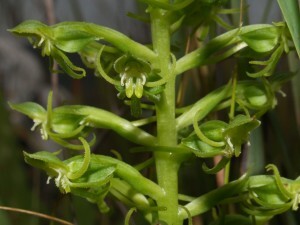 However the lateral sepals are green as are the tips of the petals, lip lobes and the stigmas. Spur 33 to 43 mm long, almost straight to gently incurved and easily visible. The “spur” of an orchid is a long tube protruding from the rear of the flower, often filled with nectar and used to lure its pollinators. 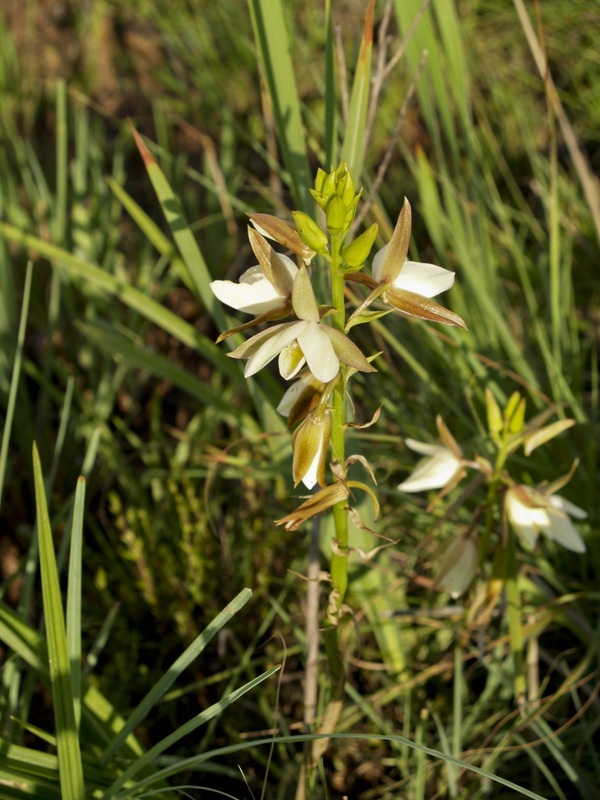 This species occur in open, sunny damp, but well-drained grassland and from available records does not seem to grow in vlei-land areas. 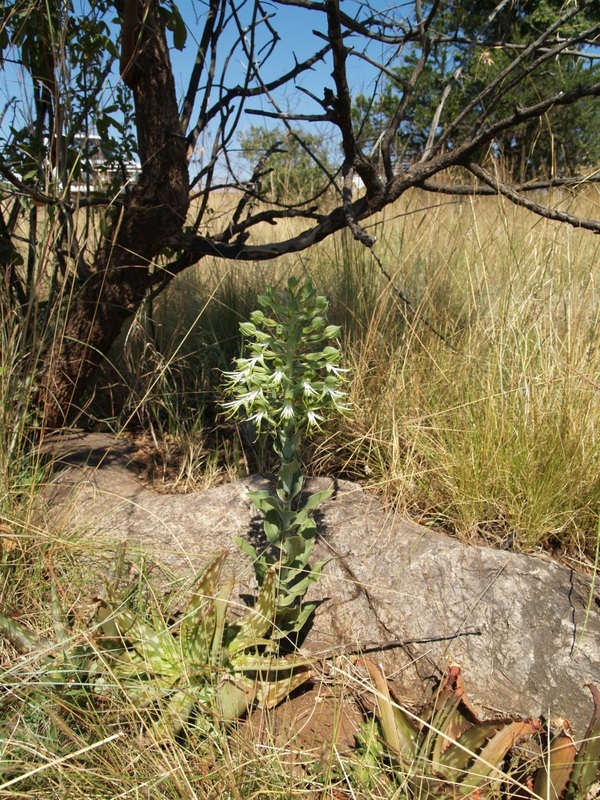 Recorded sightings are from Protea grassland, dolomite grassland and between rocks near a river. 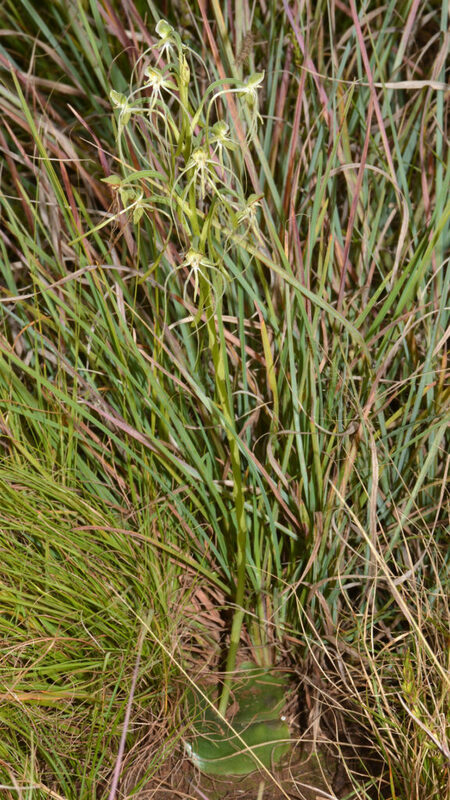 As the flowers start to open, the associating grasses may be as tall or taller than this orchid. 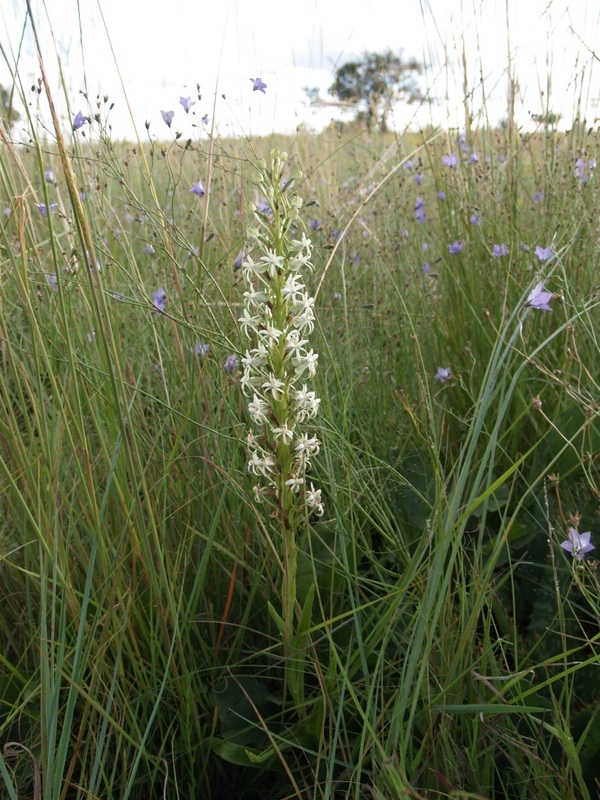 However, it seems well adapted to fairly dense and tall grassland. The fine head of flowers is conspicuous from a distance, but like most Habenaria species, it presumably relies on perfume from dusk onwards to lure its hawk moth pollinator. Fragrance however not checked and nocturnal research is needed. Although recorded from widespread and numerous localities and not currently threatened, it deserves protection wherever it occurs. 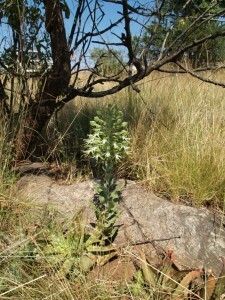 Description: Slender terrestrial growing between 120 and 295mm tall. 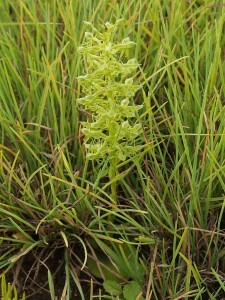 Inflorescence varies from laxly to densely. 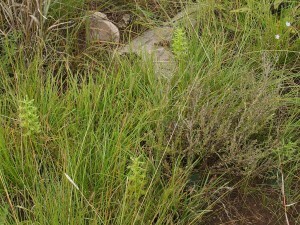 The flowers are yellowish green. 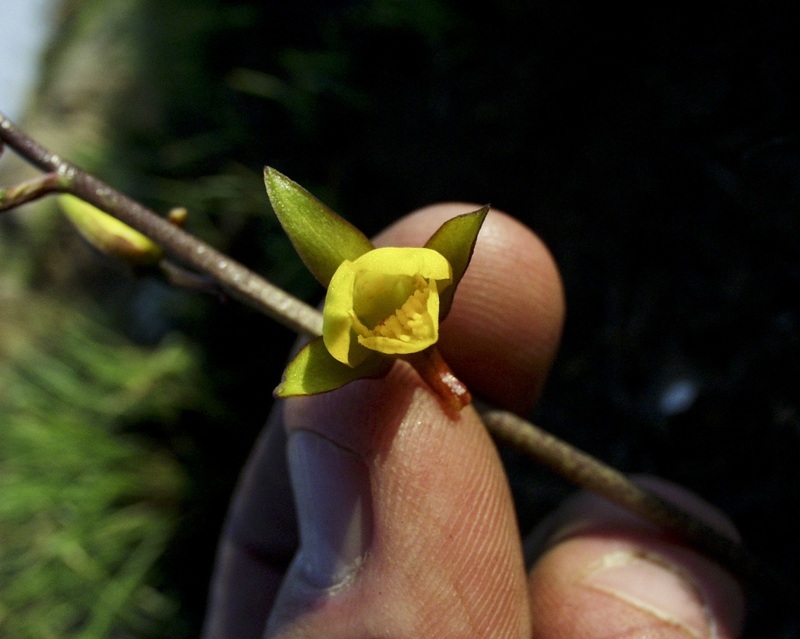 Petals are bi-lobed and the upper petal concealed by and adherent to dorsal sepal. 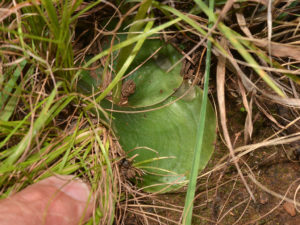 The spur is 8 to 11 mm long, slender, straight and apex inflated. 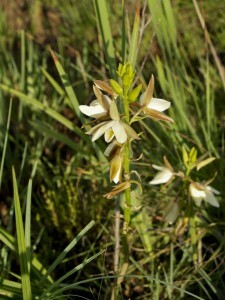 The H. lithophila is a true grassland species that seem to cope with different dominant grass species. This probably contributes to its large distribution range. 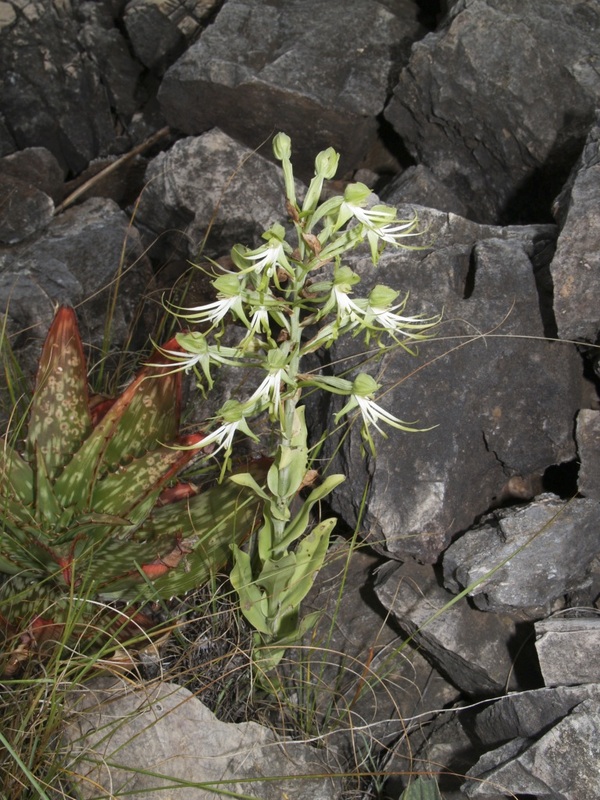 It is often found in rocky situations and has adapted to areas receiving frost in winter as well as areas, which are frost-free. 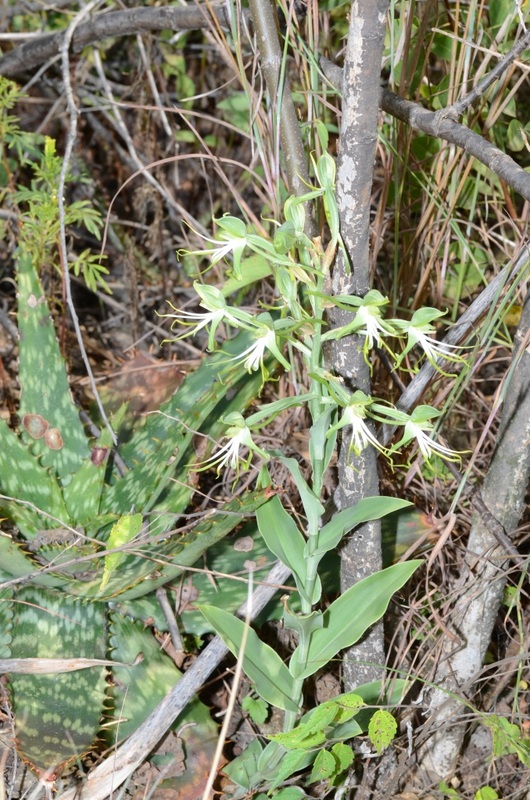 No fragrance detected during daylight but needs checking at night. 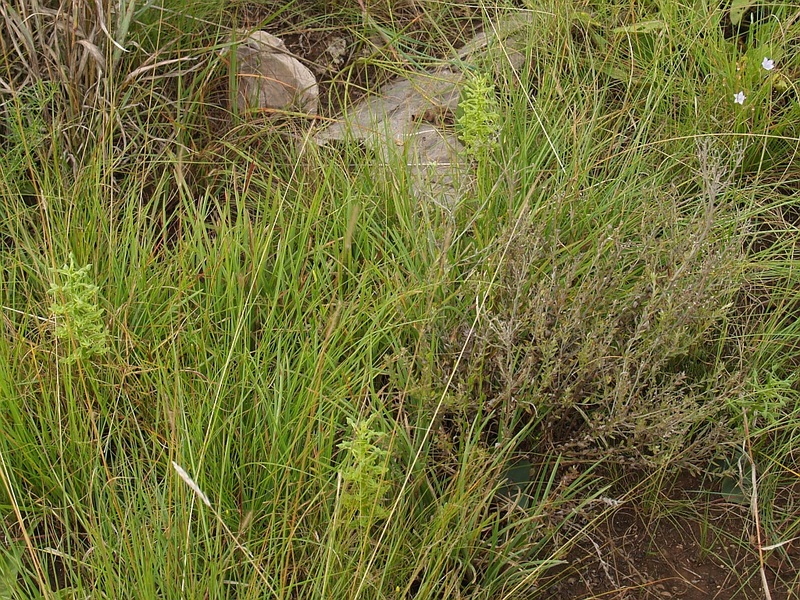 Occurrence is widespread and if suitable remaining grassland is conserved, this species will be safeguarded. 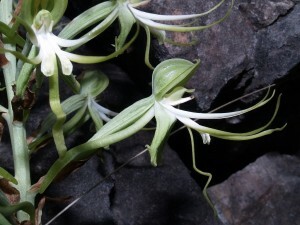 As is the case with Bonatea antennifera, many examples of this species are found around the excavations made by the calcite miners of the late 1800’s and early 1900’s. Incidentally, the calcite was used to make cement for the gold mining industry in the nearby Witwatersrand.